First things first, is it a cookbook or recipe book? I’m cooking at home.. again! I picked up the Pretty Simple Cooking recipe book at Goose the Market. Goose the Market is a full-service butcher shop, also serving cheese, sandwiches, and drinks daily! WINE ♥ If you’re still in need of the Pretty Simple recipe book, then I highly suggest stopping in and grabbing one from Goose the Market. The directions are easy to follow! There is also a homemade Creamy Artichoke Hummus recipe in the book. I had NO IDEA hummus was so easy to make at home. Find me making homemade hummus from now on.. spending five-dollars on hummus is a thing of the past. Overall, I’d say it was a simple recipe to pull together! Happy Holidays! I consider Speedway, Indiana one of my most favorite spots around town. I was lucky enough to spend a year after college living in Speedway with one of my close friends (YAY! She’s now getting married to the person she met while living there!!) ANYWAY.. living in Speedway truly made me appreciate everything it has to offer. I spent many summer nights at Big Woods, playing their Giant Jenga and drinking way too many 10th On Main beers. I also celebrated the Greatest Spectacle in Racing the ENTIRE month of May… both years. It was amazing! I have some of my greatest memories of living in Speedway during the month of May. So, why am I talking about Speedway in December? I’m talking about the Greatest Spectacle in all Holiday Lights! Lights at the Brickyard is open and the lights are bright as can be. The 3-mile drive is filled with fairytale characters, Santa in his own car, and Frosty sledding down the bleachers. 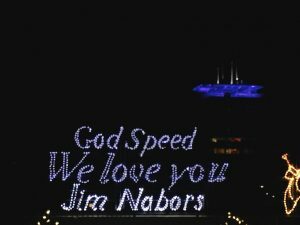 I’m not an expert on holiday lights, but I will say they’ve made a pretty epic 30-minute drive through the IMS grounds. Might I add, you also drive over the bricks instead of kissing them at the Indianapolis Motor Speedway! Let’s be honest, no one wants to kiss bricks when it’s 20 degrees out. 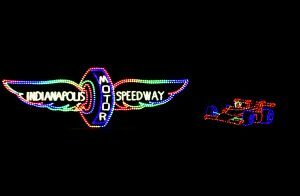 Plan a night in Speedway, then head over to the IMS to Lights at the Brickyard! I’ve added a few dinner/drink ideas for you, and my favorites at each spot. Enjoy! Ah! So I must update you as I approach the final day of my 30 Day Vegan Challenge. When I started this crazy challenge, I ultimately said I would not change my day to day activities. My week usually consists of at least two dinners or events out in Indianapolis. I’ve had to change my outlook on these events because of the lifestyle change I’ve made. My visit isn’t always based on how all the food tastes anymore (unfortunately). 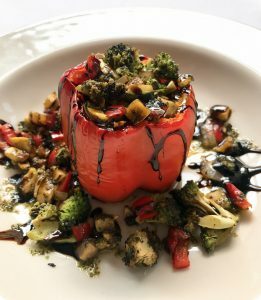 I’m now looking to see what kind of vegan dish they can prepare, how well the dish is prepared, and the overall service of the restaurant. 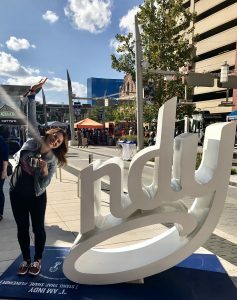 Today I’m sharing three spots I would suggest checking out as a Vegan in Indianapolis. YUM! This has been one of my favorite meals this month. 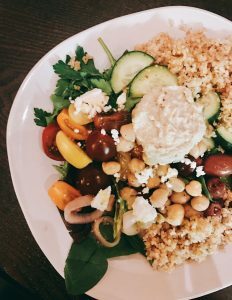 The Mediterranean Power Bowl is served with a Greek yogurt drizzle, so you must request the vegan option. 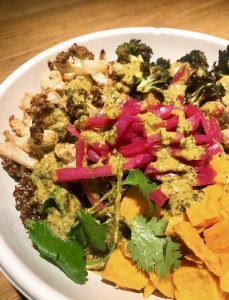 The bowl is packed with delicious roasted veggies including broccoli, cauliflower, and my all-time favorite, sweet potatoes. The glazed chickpeas and pickled red onions on the bed of red quinoa with harissa made the bowl very filling. Wondering what harissa is? Harissa is a hot chili pepper paste that gives the bowl a little kick. 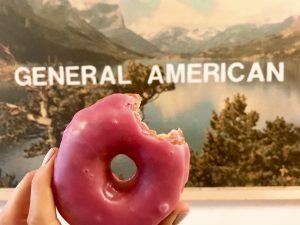 Go get your Vegan Hibiscus Donut and cup of black coffee at General American Donut Company. I highly suggest hanging in the shop to enjoy your treat. It’s a hidden gem in our neighborhood! It’s like escaping the city and bouncing back to the 90’s. Cue that’s what I like from Bruno Mars because this was the most wonderful lunch ever. Not only did I get this at Prime 47, but Chef Patrick made this dish during a Yelp Elite Event!! I’ll forever be thankful for the introduction to this delicious vegan creation.